Delicious, healthy and ideal as a starter or quick lunch. Cut the avocado in half. Remove the stone and scoop out the flesh with a spoon keeping the avocado skin intact. Cube the avocado flesh. 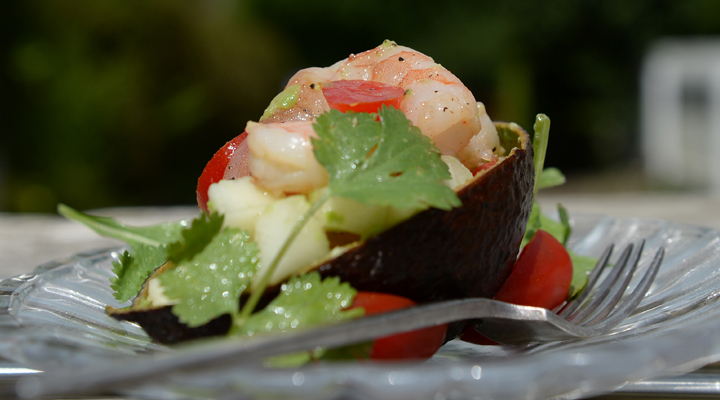 In a large glass bowl, place the melon, rocket, cooked prawns, and the avocado cubes. Drizzle with white balsamic, and extra virgin olive oil. And gently toss to combine. Add the squeeze of lemon juice and the mint and coriander. Place the mixture back into the avocado skins and serve immediately.If preferred serve into a bowl.